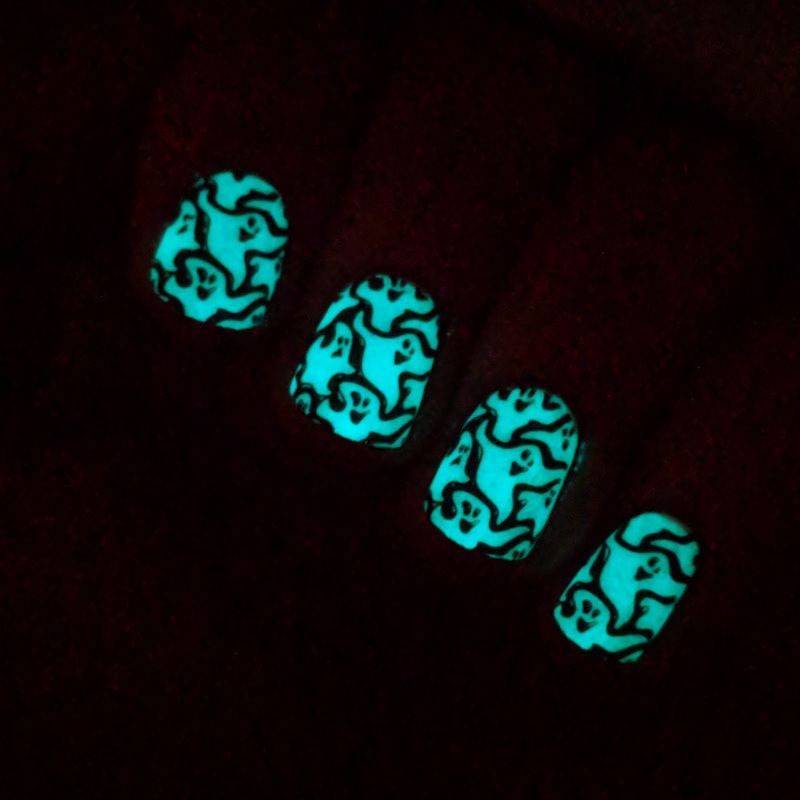 With it being Halloween season I decided to try Beauty Big Bang's Glow In The Dark powder for some spooky nails and I was pleasantly surprised. I've tried a few glow in the dark polishes and top coats in the past that were good but never lived up to how bright I wanted my nails to stand out in the dark, until now. I got the powder in the shade 2A with glows a bright blue/green tone white, and it really does glow in the dark! It was crazy bright. 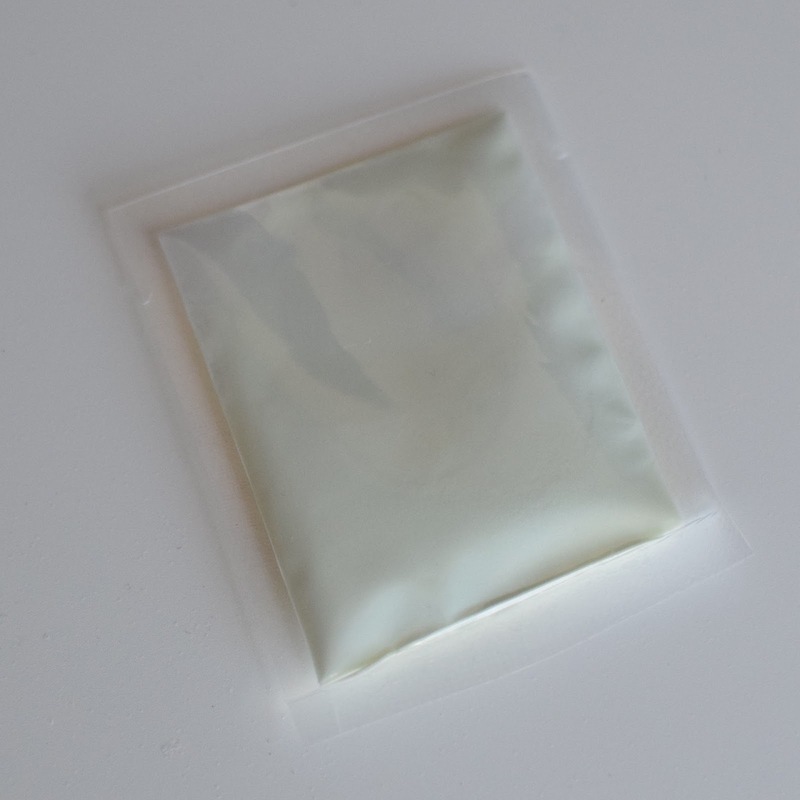 I mixed 2/3 of the powder packet into an empty nail polish bottle with 10ml of clear polish. (I make my own nail polish so I have a lot of empty bottles and clear suspension base laying around if you don't... Just mix some into a clear polish or top coat). You don't have to mix up an entire bottle like I did. Just put a bit of clear polish on something to use as a mixing palette and mix in however much you want for the specific mani you're creating. (I just wanted to always have it pre-mixed in a polish bottle ready to go). Apply a base colour, lighter colours like white are best. Let that completely dry. Then apply 1-2 coats of the glow in the dark mix and let that dry. The polish needs to be exposed to light for a while before it will glow (if you have a UV lamp that will be a quicker way, but I don't so I just wore the polish for a couple of hours in daylight and it worked perfectly). You can leave it as is or applying a design over the top like I did! (I read on the BBB website that you can mix the powder with water and apply it to clothing but I didn't test that). The polish applies and dries very gritty so use a top coat over your finished nail. 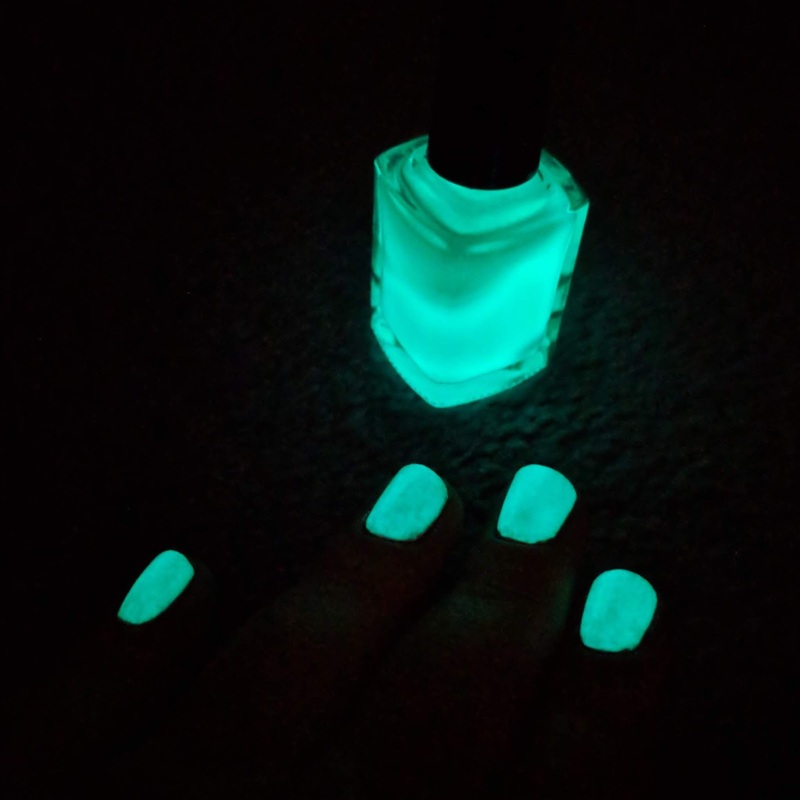 I tried putting the polish/powder mix over several different colour polishes, but it does not change the outcome of the glow colour, it will still glow a blue/green colour (unless you buy the different colour powders, they will glow in their respective colours). I also tried mixing the powder into an opaque polish and that did not work. The nail did not glow at all. (Although, it did add a cool gritty textured and matte effect to the polish). But, if you are looking for your nails to glow a specific colour, buy the powder in the colour you want your nails to glow. The end result of this powder is amazing, the powder I chose gives a greenish tint to the white base, which I like the effect of and the glow is intense and super fun... A great extra something to add to your Halloween themed nails this month. It doesn't have to be just for Halloween though, using this on your nails will definitely spice up with mani if you're planning on going to any kind of function in low lighting. I will definitely be using this a lot in the upcoming holiday months! 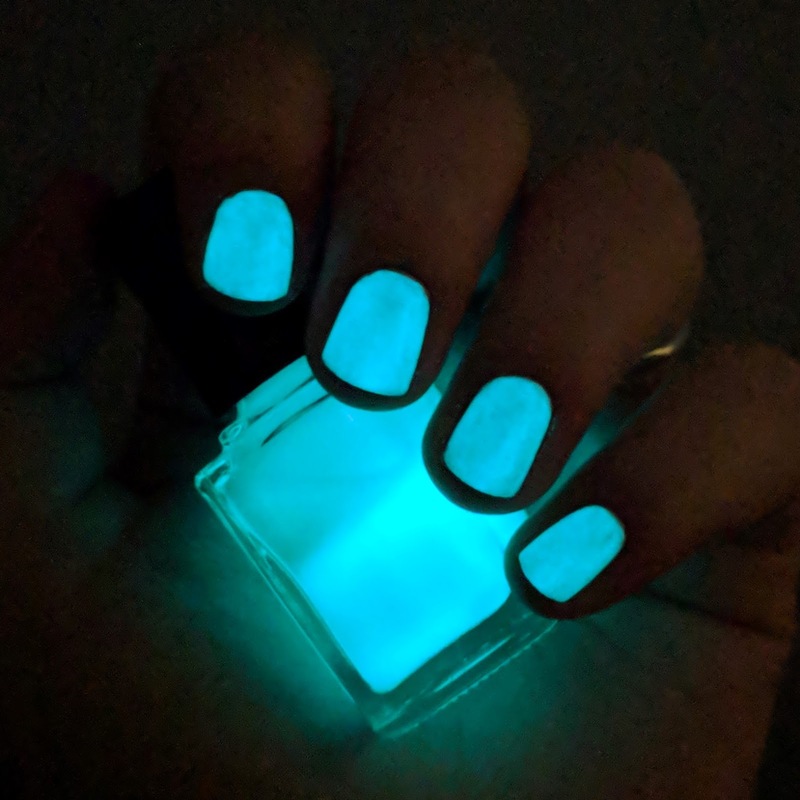 If you use this glow in the dark powder on your nails, show me your designs on Instagram or Twitter.